Simple beauty of Eastern Long Island! Our beaches are beautiful, but some unwanted little visitors have arrived, and that necessitated the following trip. the former pattern. What to do? Marian decided to abandon her usual “Grin and Bear It” approach for a Lycra body suit that will offer her some protection. 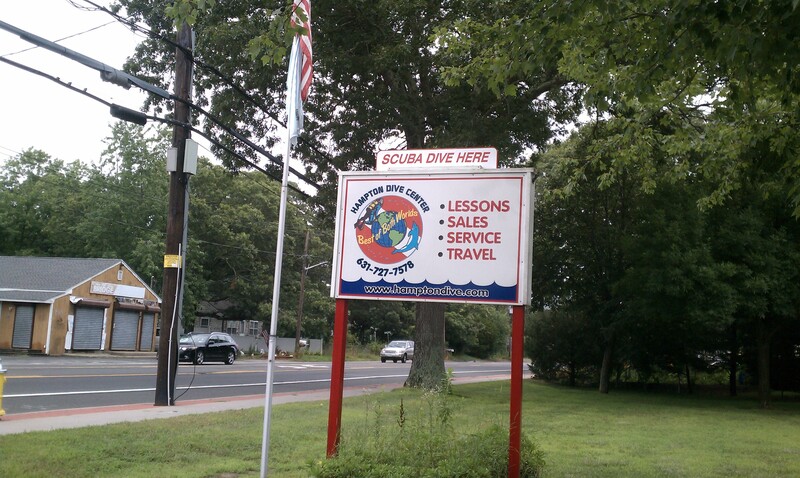 We set out for our local Scuba Dive shop, The Hampton Dive Center, located on Flanders Road (Rt. 24) near Riverhead. There Brian was very helpful in selecting the right suit and size for Marian’s petite yet plush figure. The shop stocks a complete line of dive equipment, offers dive courses and certifications, and features some great dive trips to exotic locations around the world. Our Hamptons beaches are great, but who wants to miss diving in Fiji? Properly outfitted, we pressed on. After the dive shop visit we got back on Rt. 105, and headed north to Sound Avenue, the northern of the two East-West roads that span the North Fork. We enjoy the rural character of this road, with its farms and farm stands that remind you the cultural and the agricultural are one out here. Thinking of eating, we decided to visit the Garden of Eve Cafe. The Garden of Eve is at once a farm, a farm market, a garden center, and a community supported agriculture (CSA) site. The full service cafe was not open (only weekends, it seems). We will be back on a weekend in September to try the hot menu and will let you know about what we liked, and what we loved. Instead, we visited a few of our local friends. Marian conversed freely with them to gain insight into life on the farm. Unlike the jellyfish, these animals are truly friends. Next time we will be visiting Goodale Farms to see some baby goats.